In November 2018, Jisc were invited to lead a session at the SDF conference in Bournemouth. The session was based on some of the activities that we run during the Digital Leaders Programme. While most of the attendees in the session may not have considered themselves ‘leaders’, the session was aimed at the concept of staff being able to either lead change at their organisation or understand the requirements needed to cement change into their practice around digital. For this post, I have decided to talk a little about how important a short mapping exercise could be to planning how to move forward with digital. How good are we at technology? 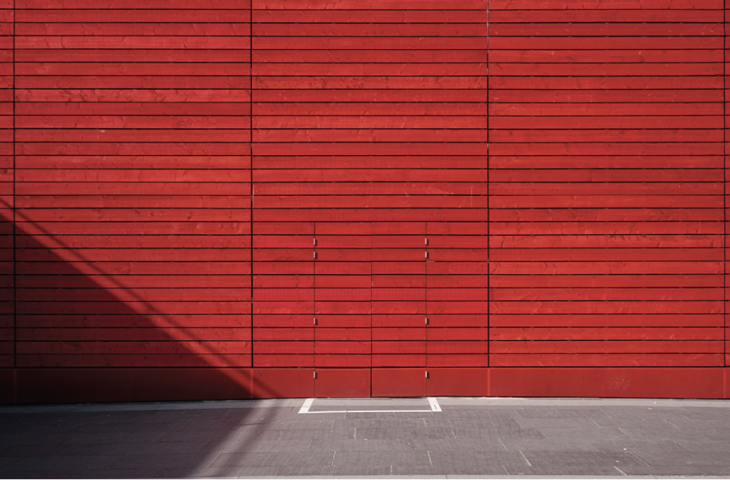 While some can often feel that using technology in their role feels like a huge wall-like barrier, sometimes there can be hidden or undiscovered doorways that allow us to move past those barriers and into a space of discovery, development and new found confidence. But why is digital so important? Each time technology is used, to enhance learning or student experience for example, there are the opportunities to analyse the behaviours of the users and learn from them. From library use to engagement with learning platforms (VLEs) and resources, a picture can be built up around the story of how our users are accessing their content. These are key tools to discovering the impact of how we are using technology and whether we are using it in a positive, transparent and effective way. It is hard to make effective changes if we don’t know how we and our users are using the technology around us. During the workshop, the attendees were asked to think about their own personal practice of digital. One of the most important elements to effecting change in our practice and our organisations, is to understand where we are with digital now. Looking at how we may use different digital platforms or tools in a broadcast/read behaviour, or how we may engage with others through it, we also map these against using them as an individual or from an organisational role. The idea of this process is to identify where there are gaps or where there is practice that could be used in a different way. It isn’t about labelling ourselves as any one kind of user but, understanding our own practice and identifying strengths and areas for change. Reflecting back on their maps, the attendees were asked to mark where they liked using the tools and where they wanted to make changes. While this process is the personal view of our attendee’s digital practice, it can be an interesting activity to compare it to how other’s may perceive their digital presence. This was not part of the session in Bournemouth but it forms a part of the Digital Leaders Programme homework between the residentials. Developed by myself, Dr Donna Lanclos and Lawrie Phipps, the ‘Digital Perceptions Tool’ asks users to select words from a list that best describes their digital presence and use. The user then sends a link out to as many colleagues as they want. These colleagues also pick from the same list of words which gives the user a breakdown of where their colleagues have identified with them against where they saw themselves. Similar to a Jahari Window, the results can provide quite an eye opener. I found that some people actually think I am Fun!! The mapping process can also work in the same way when looking at how an institution, department or team uses technology. It can be useful for any group to understand where it is with technology and how to move forward. Identifying the differences across teams, groups or an organisation can flag up many issues that maybe causing a disconnect with its users. 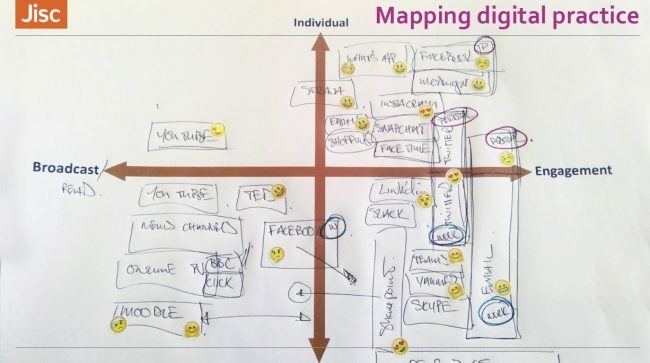 Mapping out an organisation’s digital use can bring an informed discussion into strategic thinking. Again, it is all about knowing where you, as an organisation, at this point before making decisions on next steps. Think about how you can apply the same thinking to map out how your teaching sits across analogue and digital or informal and timetabled sessions. So, this is one of the opening activities on the Jisc Digital Leaders Programme. As we progress through the programme, the learning is aimed at how leaders and staff at an organisation can overcome barriers to progress with digital, and implement change in a way that is effective and allows those changes to be cemented into position. Through techniques such as design thinking, action mapping, digital storytelling and incorporating co-design into strategy and vision building, we explore how your organisation can overcome the bumps in the road and define where it wants to be going. A recent meet-up of Digital Leaders Programme Alumni took place at Digifest 19, where there was a huge amount of conversation of how their institutions and organisations were implementing elements taken from the course. The next digital leaders programme will be running in May 2019 in Cardiff. Please get in contact if you want to know more or visit https://www.jisc.ac.uk/training/digital-leaders-programme.